We decided to try Mexi-WIngs Mexican Restaurant in Athens, Tennessee. A colleague and I had to meet up for a short business meeting. We needed wi-fi which Mexi-Wings doesn't have. The staff however was happy to unplug an indoor neon sign to accommodate our request. There are a few locations in Athens. We ate at Mexi-Wings 2 next to Days Inn. It's a local 'mom and pop' kind of chain. Some say it has the best Mexican food in Athens. I can't say that yet because I've not tried them all yet. I can tell you that my chicken chimichanga was very good and served hot. As requested, the pico was left off. The beans and rice also were good. Chips and salsa are brought when you sit down. The straws had the paper attached to the end. Mexi-Wings 2 is the kind of Mexican restaurant where the family can come. It's casual or business casual. The staff was nice and the air conditioning worked. My favorite Mexican restaurant may still be the La Palma De Oro in Knoxville. The impractical drive is over an hour away. If dining out in Athens I'd be glad to return to the Mexi-Wings 2. Good food and good service make it hard to beat. 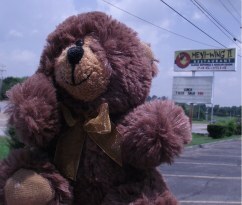 Here's the DV travel bear in front of the sign now. He and friends are traveling to raise awareness of domestic violence. Click the photo to find out more.